Experience life on an EvenKeel and enjoy every step you take. High-performance custom insoles created from your smartphone. 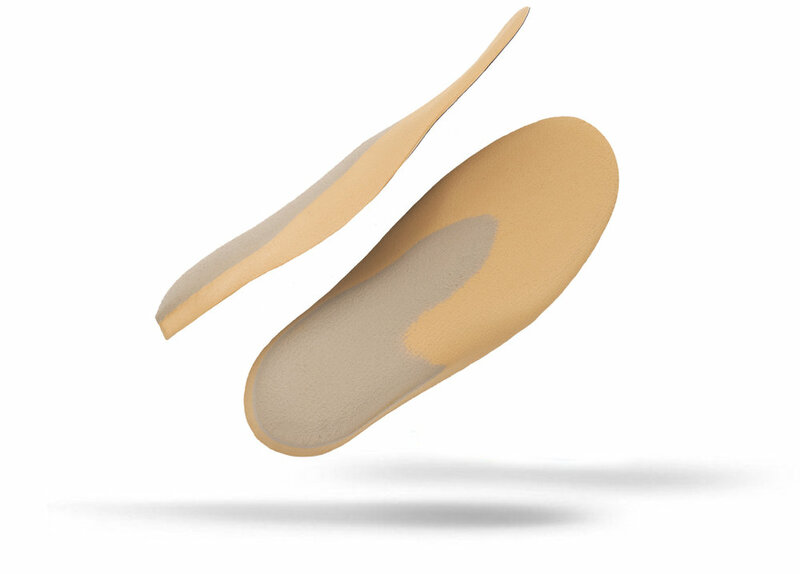 Designed for use in sneakers and select dress shoes, the patented EvenKeel insole was developed by renowned sports podiatrist Dr. Frank J. Santopietro, D.P.M. after years of clinical trials and the direct treatment of professional athletes from the Tennessee Titans, St. Louis Rams, and New England Patriots. Our feet carry us through the day but are often the last thing we care for. EvenKeel insoles help your body move the way it was intended to. “Do I need custom insoles if I’m not a professional athlete?” — absolutely. Your stride affects you in more ways than you can imagine, and it all begins with how your feet touch the ground. In addition to foot pain, leg, knee, hip, back, and neck pain can be attributed to the way you walk, and the firmness of the ground your feet strike. EvenKeel Performance Insoles are designed to help position the body to move in a way that both alleviates and prevents these potential health issues, while offering support to combat harsh manmade surfaces such as concrete, and hard natural elements found outdoors when walking, running, or hiking. EvenKeel insoles are made-to-order in Brookline, Massachusetts by renowned sports podiatrist Dr. Frank J. Santopietro, D.P.M. Unlike generic over-the-counter insoles which are not overly effective, EvenKeel is the premium alternative to expensive custom orthotics. EvenKeel insoles are crafted from a single block of the highest-quality material available on the market today, and best of all, there is no need to leave the comfort of your home to get them — simply snap a few photos of your feet, upload them through our web app, and we’ll take care of the rest. Dr. Frank Santopietro, D.P.M. created EvenKeel Performance Insoles and the technology behind the EvenKeel web app. He is the Chief Medical Officer and lead podiatrist of EvenKeel Podiatry located in Brookline, Massachusetts. He brings 40 years of clinical experience in sports medicine and podiatric surgery to both EvenKeel Podiatry and EvenKeel Performance Insoles. For 25 years, Dr. Santopietro was the podiatric physician for the New England Patriots, and the former Chief of Podiatry at Children’s Hospital in the Division of Sports Medicine. He served as Clinical Assistant Professor in Family Medicine at Brown University, and as podiatric consultant to the Boston Ballet, Brown University, Boston College, Providence College and Emmanuel College. EvenKeel has the perfect insole, just for you. EvenKeel’s firm insole base is ideal for activities where the foot requires immediate reactivity to the ground. Constructed for speed, pivoting, and motion, it is perfect for casual and low-impact walks, in addition to long, intense runs on any type of terrain. The black material provides a sturdy, supportive base which holds the heel and mid-foot in an ideal position, while the orange layer provides cushioning without sacrificing performance. EvenKeel’s soft insole base is ideal for individuals experiencing foot, leg, knee, hip, back, or neck pain, and for those working in active fields such as medical, retail, engineering, education, maintenance, and hospitality. Our unique cushioning provides maximum comfort and protection to the body by easing the impact of harsh solid surfaces, while also working to correct stride imperfections. Perfect for — Individuals with minor foot pain who also experience knee and lower back pain. Active Nylon adds a soft layer of foam to enhance the enjoyment of physical activity while decreasing painful side effects. Perfect for — Those who experience heel pain, or are looking for extra firm support. When adding Tan Suede to our firm base, the result is an extra-firm, ultra-durable insole, yet one that is soft and luxurious to the touch. Perfect for — Individuals with frequent aches and pains. Black Faux Suede is our thinnest top cover material, making this combination our firmest, perfect for use in both athletic sneakers and dress shoes. Perfect for — Individuals with pain in the bottom of the heel or arch, typically felt most while walking (plantar surface pain). Active Nylon paired with our soft base makes this combination our softest. Perfect for — Those looking to improve or prevent overall aches and pains caused by incorrect stride and harsh surfaces. Tan Suede adds a firm layer of support to our soft base, making this an excellent everyday combination. Perfect for — Individuals in need of general foot pain relief who are also looking for a great everyday insole option. The soft material under our thin Black Faux Suede materials offers a comfortable, stylish combination.